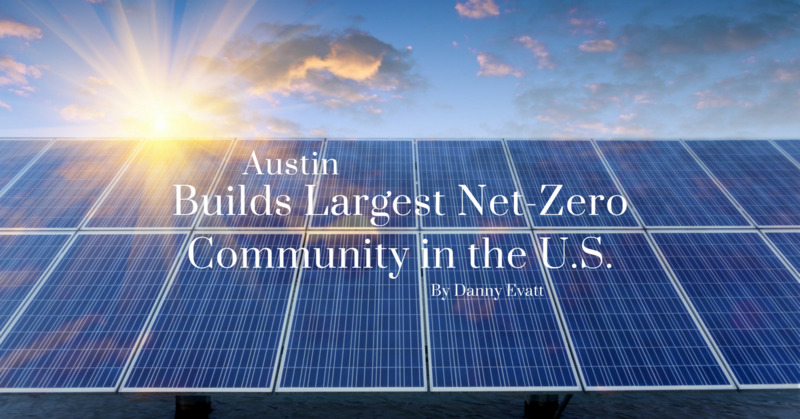 Austin Builds Largest Net-Zero Community in the U.S.
With the construction of Whisper Valley, a new community on the east side of Austin, this city will become a world leader in energy efficiency and sustainability. That's because Whisper Valley is set to be the largest net-zero community in the United States. Read on to learn more about what net zero means and how Whisper Valley will put this sustainable building practice to work. The simple definition of a net-zero building, according to the Department of Energy, is one that produces as much or more energy than it needs to function. This is accomplished in a variety of ways, like using solar or wind energy to provide electricity and by installing efficient systems that don't require a lot of energy to operate. Geothermal heat pumps are an example of this. Additionally, most net-zero buildings feature cutting edge insulation, efficient windows and even things like reflective insulation or roofing in an effort to minimize energy use on heating and cooling. Progress on the construction of this new community seems to have gone smoothly because it is estimated that the first units will be ready for new tenants sometime this summer. Right now, roughly 30 homes are going up, built by AVI Homes and Pacesetter. The completed project is slated to be much larger than the initial 30 homes, however. It is forecasted that when finished, Whisper Valley will feature 7,500 units, both homes and apartments, as well as two million square feet of space devoted to retail. Estimates say the community will be completed about a decade from now at a cost of around $2 billion. No contracts have been signed yet for the new homes, although the builders do have a long waiting list. Right now, home prices for Whisper Valley dwellings are between $190,000 and $300,000 – a somewhat surprising price considering that Austin's February median home price was $287,000. In order to be a net-zero community, Whisper Valley will be taking advantage of the latest and greatest in green technology. It all starts with solar thermal energy to provide power. Homes will be equipped with geothermal heat pumps and Nest smart home devices to control them efficiently. These homes boast such things as Bosch appliances, which are known for their energy savings, and each home will be connected to the internet via Google Fiber. Between the low price tag and the chance to live a net-zero lifestyle, buyers will be snapping up Whisper Valley properties as soon as they become available. As this community grows, it will likely become a booming real estate market as it places Austin on the world stage in energy efficient living.